Goal #1: Hit all the burger joints in the Austin-Houston-DFW triangle listed in Texas Monthly’s article “The 50 Greatest Hamburgers in Texas”. I know this isn’t the most original idea out there, but it covers nearly 40 of the 50 burgers on the list and I figure it’s a good place to start. I wish I could try them all, but I really don’t see myself heading out to El Paso or Buffalo Gap anytime soon. Who knows, though? I guess it could happen… Let the challenge begin!! Anyway, back to this past weekend. I was really hoping we might be able to squeeze in a visit to Pappas Burger (one of my favorite places in Houston to enjoy a burger), but that didn’t happen. For lunch we ate at a Japanese place, and for dinner we ate at Cafe Express. 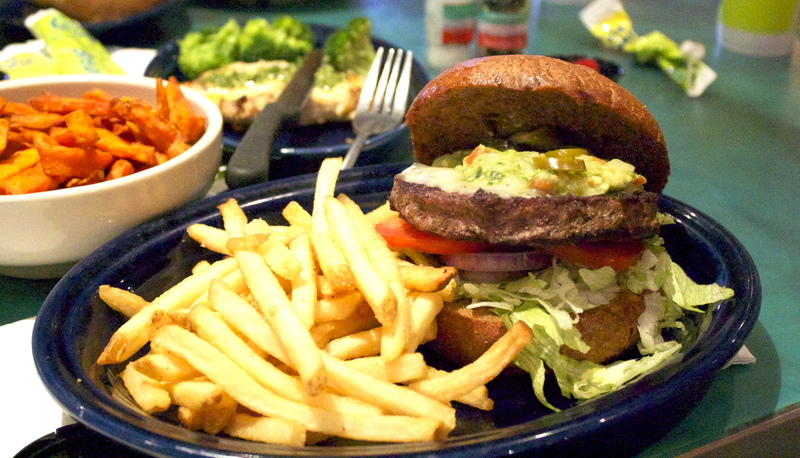 Cafe Express is known for its fresh food loaded with flavor. They pride themselves on their “made-from-scratch” philosophy and offer a menu of salads, sandwiches, pastas, and grilled/roasted entrees. I really do enjoy their crisp salads and have been known to indulge in one of their pastas every now and then, so I had high hopes for their gourmet burger offerings. At nearly $10 for a burger and fries, I anticipated high quality and high flavor. Taking into consideration that one of the founders of Cafe Express is regarded as one of the inventors of modern Southwestern cuisine, I ordered their Southwest Burger – 1/2 lb Angus beef patty (fresh, not frozen), guacamole (made fresh in house daily), Jack cheese, lettuce, tomato, red onion, and jalapeños all on a wheat brioche bun (I also added a little dab of ketchup for a touch more flavor). I really wanted to enjoy this burger. Really…I did. Unfortunately, my disappointment of not going to Pappas Burger grew as I made my way through this burger. Wondering where the juices are? Yeah, I asked myself that same question. The Angus beef patty was sadly overcooked and under seasoned. I honestly thought that they may have used a frozen, pre-formed patty, but was informed otherwise. 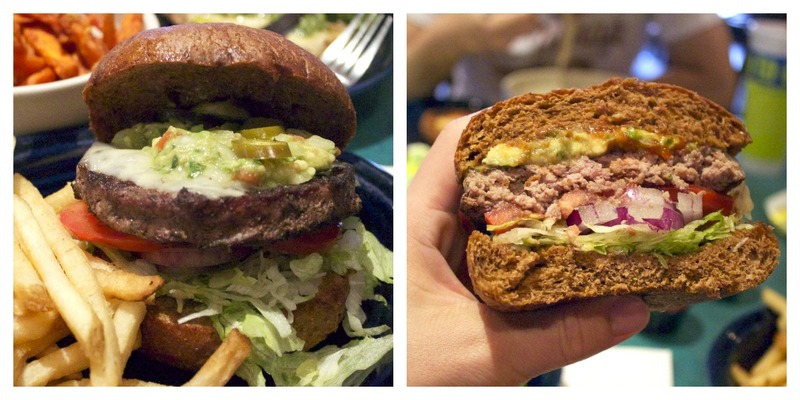 The Jack cheese didn’t impart much flavor, and the scant dollop of guacamole, like the patty, could’ve used more seasoning. The brioche bun was so hearty that I felt it overwhelmed the rest of the burger. And like their fries (which weren’t too, too bad), their buns come in frozen. Frozen buns?! *Sigh*…what happened to fresh and made-from-scratch?? I truly am a fan of Cafe Express and am happy to have found out that they have a location here in Austin in addition to the ones in Houston and Dallas. However, I think I’m gonna stick with their salads and other menu items. Their burger just didn’t do it for me, and for the price, I expected a lot more. On a happier note… Just wanted let you guys know about an AWESOME burger blog based out of NYC that you should definitely check out. Every Wednesday, the guys at Burger Weekly post a review about one of their burger adventures as they make their way through the multitude of restaurants in the Big Apple. You may even catch me there guest posting as one of their “Foreign Affairs” correspondents. Until next time…stay hungry, my friends.